Division of polynomial by monomial = divide each term of a polynomial by the monomial and simplify. • Obtain the polynomial(Dividend) and the monomial(divisor). • Arrange the terms of the dividend in the descending order of their exponents. 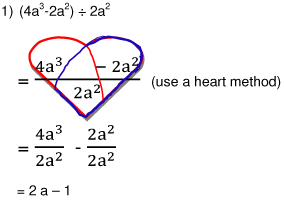 • Separate the each term using heart method. • Divide each term of the polynomial be the given monomial by using the rules of division of a monomial by a monomial.